The world is a scary place. Every day we’re forced to make choices, no matter how small, that may be leading us along a new path. Whether that path is heading towards something good, like a promotion or meeting some special, or towards something bad, like an accident, or even death, we can never know. In the end, that’s possibly the scariest thing of all. 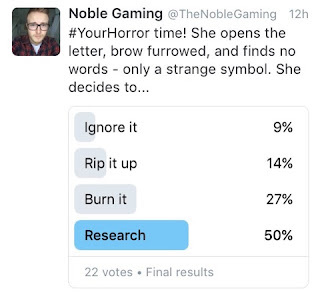 From Monday to Friday, at roughly 8pm GMT each day, there will be a new Twitter poll. These polls will ask you to choose between a number of options, each of which may take the story in a new direction. Sometimes a decision will give a bit more insight into the character, setting, or backstory, while other times the decision will solely focus on driving the narrative forward. I will then write these choices up every weekend, creating a story from all of the choices that you made. Excited? Intrigued? A little bit terrified? Yeah, me too. Get involved. 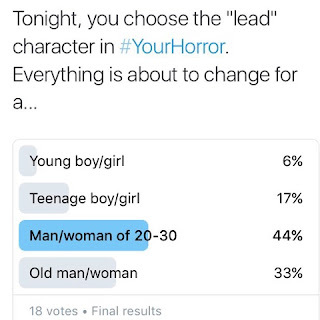 #YourHorror began with an unknown character. We didn’t yet know their name, their gender, what they looked like, what they did for a living, or even how they felt about MTV’s take on the classic Scream franchise. All we knew is that they were in their mid-20s. Let’s keep reading. 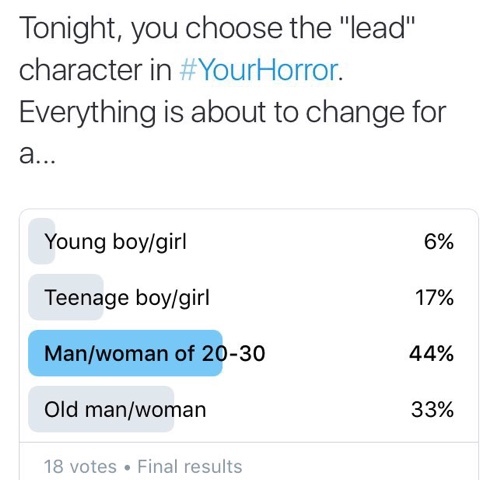 The horror specialists had decided. Our main character was a young woman in her mid-20s, and she lived in a small town. Not much about the town is yet known, but I imagine that it is the kind of place where everybody knows everybody else, and that the arrival of someone new gets around pretty quickly. What they won’t know is that some voters have already pegged her as the “final girl.” It is far too early to know if she will even make it more than a few weeks in this ever-changing story, but for now she is well and truly among the living, and recently began renting on the outskirts of a small town. They say that moving is one of the most stressful things a person will ever do in their lifetime. Maybe if she had moved to a different town that would have been the case. She could have met a guy, or a girl, whatever she’s into, and settled down into her happily ever after. It wasn't meant to be. What was meant to be was that this girl came to this town, as decided by you. It was for that reason that our unlucky character received an unusual letter that morning. She was taking the day at her own pace – after all, she didn’t plan to begin working immediately. She slept in until 10am, eased into the day with coffee and toast, and then planned to spend the majority of the day unpacking boxes and playing the difficult game of “keep, store, bin” with her personal belongings. Like most people, it wasn’t a game she expected to win. Whether she used that smoothie maker in the last few years was irrelevant. At any point, she might decide she was going to be one of those people that jumped out of bed for yoga at the crack of dawn, and then blended – and enjoyed – a kale smoothie. It was always a long shot. As soon as she threw the smoothie maker away, though, the fantasy went with it. She was well aware that many of her belongings, each with their own fantasy, would go back to collecting dust somewhere until she was replaced by some sort of “morning person.” It sounded awful. It was as she began sorting through some of the boxes that a shadow passed across room. She paused. Someone had just walked past the window. She listened for someone at the door, perhaps coming by to welcome her to the area with a basket of muffins. On tiptoes, she crept round to the front door and peered out through the peep-hole. There was no-one there. Had she imagined it? She opened the door and stepped outside, hoping to catch anyone sneaking around the premises off-guard, or at least get in on those welcome muffins while they were still warm. Large hedges spanned both sides of the property, designed to give the renter some privacy, and a stone path led from the front door to an iron gate at the bottom. There was space for a car to be parked on the road just on the other side, but she didn’t own one, and the town itself was only about 10 minutes away by foot. It was then that she realised she didn’t have any shoes on. The stones were cool between her bare toes. Her eyes widened ever so slightly. 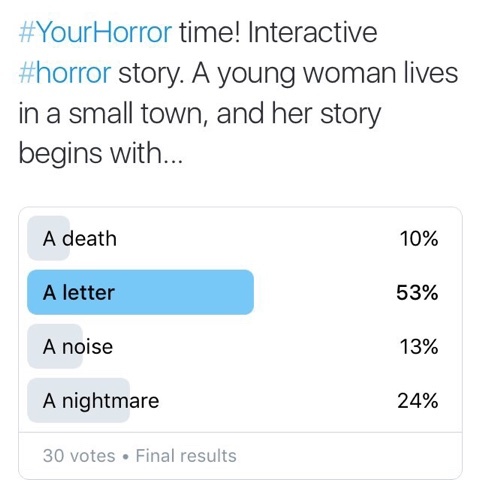 There was a letter. Her name was scrawled across the envelope, but it had no postal address or stamp. The shadow had delivered this letter by hand without even knocking on the door. Had they known that she was in? They walked right by the window, surely they’d seen her. Despite the fact that the weather was relatively mild for early February, she rubbed her arms. Almost hesitantly, she picked up the letter and retreated back into her property, locking the door behind her. After a couple of minutes she felt normal again. It was nothing. The goosebumps that had risen on her arms returned to the things of children’s books (and apparently movies), and she decided to open the letter. A part of her was shocked to find a strange symbol on the worn paper inside the envelope, though she also felt that this – even if she didn’t know what “this” meant – was all it could have ever been. 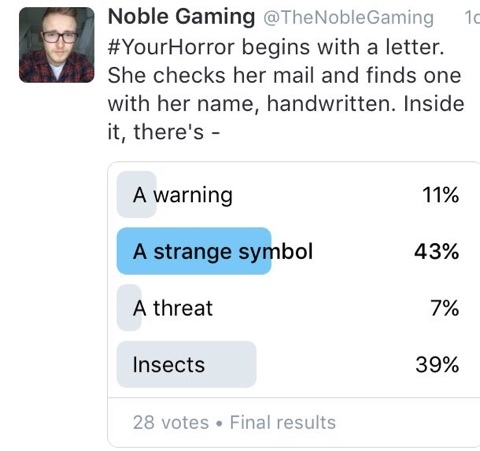 If a stranger delivers a letter in a strange way, you should probably expect the contents of the letter to be a little… strange. The symbol was drawn in dark red ink that looked far too similar to blood for her liking. She just stared at it for a while, trying to figure out what the design could mean, and whether she could decipher a pattern from its deliberate lines and curves. For a brief, nerdy moment, she wished she had a Giles from Buffy the Vampire Slayer… he’d sure know what it meant, with his dusty books and wide array of sweater vests. She sighed. Life was full of last-minute changes and decisions, and unpacking could wait a day. She needed to know what this symbol meant, or it was going to bother her all day, and, more importantly, all night. What if the symbol was a curse that removed the cold side of the pillow? That just wouldn’t do. In the light of day, she could joke about such things, knowing full well that her thoughts would turn darker if she didn’t look into it before then. If she still couldn’t let go of the smoothie maker after all of these years, who knew what kind of twisted nightmares the unknown symbol, delivered by an unknown person, would create in her mind. One problem; the internet hadn’t been set up yet, and she’d used up all of her mobile data on the way over in the passenger seat of the moving van. Someone had to tweet things like “new year, new me,” and “things will be different in the new town,” so it might as well be her. At least then it was somewhat ironic. She regretted it now, of course. There was an old book shop in town. After seeing the property and trying to hide her interest in the place, which she could only imagine made her seem more powerful and worth haggling with, she’d taken a walk through the town. She’d noted a charity shop for her unwanted junk, a café where she might occasionally stop to drink with a book, and a book shop, from which she might buy said book. It was a little darker, a little less modern, and almost seemed to retreat into itself. If anything, that made her want to go in more. She hadn’t been expecting it’d be this soon, though, and especially not for this reason. Old-school research. Giles would be proud. She grabbed an old pair of jeans from one of the boxes, pulled on a vest top, a zip-up hoody, and some worn boots – this wasn’t a fashion show, it was research. The letter went back into the envelope, into the back pocket of her jeans, and she started the walk into town. Without realising it, she glanced over her shoulder a few times along the way. When she reached the book shop, looking just as dusty and withdrawn as she remembered, she patted the letter in her back pocket. Still there. Nothing left to do but go in and see if there were any books covering strange symbols. Then again, neither do we. Brilliant, really enjoyed that. It's fun to see how the outcome of each poll fits in, as well as seeing bits and pieces of twitter replies being brought into the story. I'm really excited to see how it's all going to unfold and I can't wait to see what the symbol is, suppose it remains to be seen if I'm dying to find out! Really glad you liked it, and thanks so much for voting, sharing and commenting. Your support means a lot! Writing it up was a lot of fun, and I was surprised how natural it felt. The exciting thing is that I'm right there with you - I have no idea what happens next, because it's all up to the voters! Nice work, Ryan! An enjoyable first chapter with many more to come, I hope. Bonus points for mentioning Buffy the Vampire Slayer. Love the idea of an interactive story and all the possibilities it brings. There are definitely a number of interesting ways you'll be able build on the interactivity element beyond Twitter polls and decisions. Look forward to finding out what happens next. I'm loving it, too. Who knows what will happen next? I certainly don't. Would be great to hear if you have any suggests on expanding the interactivity to other areas. Feel free to tell me any ideas! 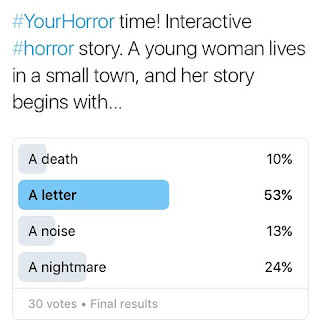 really loving this interactive horror story. Is lots of fun seeing how we all vote , and wondering how this story will unfold.